Rental Application – To verify that a potential lessee is able to afford and maintain the property during the term of the contract. Association of Realtors Agreement – Provided by the Hawaii Association of Realtors for a residential property for a fixed term. Commercial Lease Agreement – For any type of non-livable use such as space for a business to operate. Lease with Option to Purchase – Typical residential contract that offers a tenant to buy the property from the landlord. Month to Month Agreement – A lease with no end date and after commencement, landlord must provide forty-five (45) days notice to terminate while the tenant must provide at least twenty eight (28) days according to § 521-71. Roommate (Room Rental) Agreement – Between the individuals living in a shared residential arrangement to create: times for cleaning, who pays for what bills, and anything else that should be distinguished between the parties. Standard Residential Agreement – Fixed term arrangement typically for one (1) year. SubLease Agreement – A tenant that is under a legally binding lease with the landlord may re-rent the property to someone else, known as the sub-lessee, with the landlord’s consent. 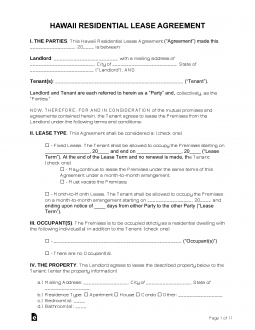 Termination Lease Letter – Form needed in order to cancel a month to month lease according to Statute § 521-71. Inventory Checklist (§ 521-42) – Prior to any verbal or written agreement the landlord must provide a copy of the condition the premises in addition to any furnishings or appliances. Lead-Based Paint – Federal law requires all landlords/managers to give this disclosure to all new tenants if the property was constructed before the year 1978. Identification (§ 521-43) – Landlord must disclose any persons allowed onto the premises. In addition, the landlord must provide their tax excise number to the tenant so that they may be able to file for low-income tax credit. According to § 521-53 all landlords are required to give at least two (2) days’ notice to the tenant prior to going inside for any scheduled appointment. Maximum (§ 521-44) – Landlord may not request more than one (1) month’s rent from the tenant. An extra fee may be added if the tenant has a pet. Returning (§ 521-44) – Landlord must return the deposit within fourteen (14) days from the termination date.